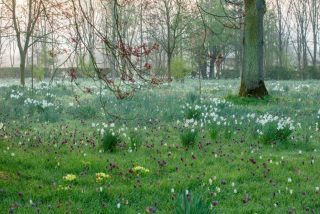 At Morton Hall, there are two different spring bulb meadows: The Parkland Meadow, known for its magical display of fritillaries and narcissus in April, followed by camassia and alliums in May and the smaller New Garden with its earlier display, starting with snowdrops in February and finishing with species tulips, scilla and primulas in early to mid-April. The New Garden must be mowed in late May when its species roses are coming into their own but are under threat from the rapidly growing grass. This gives the bulbs just enough time to accumulate nutrients and allows the scilla to go to seed. The grass is cut to a length of four to five inches and maintained at that length until the late autumn when it is cut as low as possible. This last cut is very important as it improves the visibility of early flowering small bulbs. Like scilla, fritillaries, camassia and alliums multiply by seeding. Because of the later flowering time, we wait until mid-June before the meadow is cut. At the end of September, the grass is cut again in preparation for the annual bulb planting. 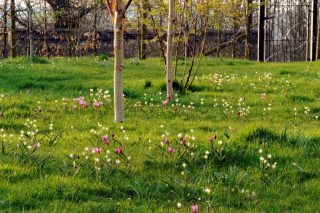 Finally, like the New Garden, the meadow is cut again at the end of October for a perfect crocus display in the early spring.